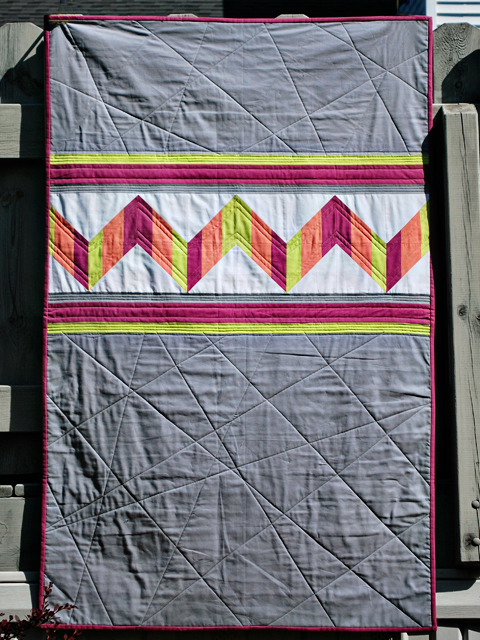 Bijou Lovely: neon chevron quilt. 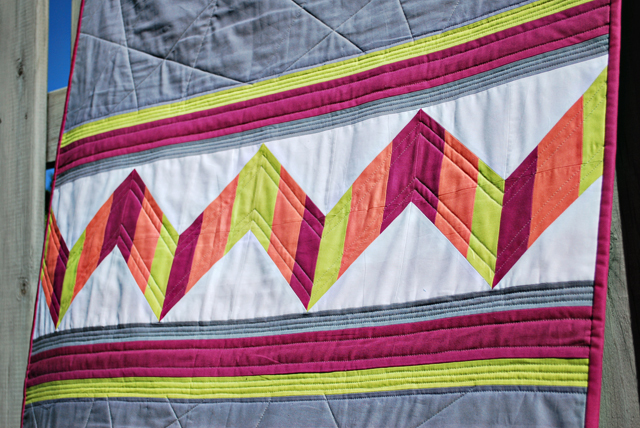 This neon chevron quilt has been finished for awhile, but for some reason I just couldn't get around to photographing it! I finally took it outside today to get some pictures, just in time to participate in the Blogger's Quilt Festival. 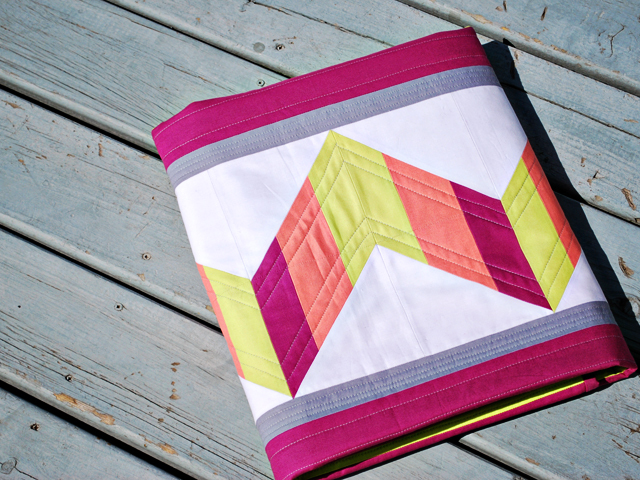 This quilt was inspired by the neon and chevron trends that have been so prevalent lately. It's definitely bright and fun! As you can see I echo quilted along the chevron panel to bring out the pattern even more, and the rest I just quilted in random straight lines. 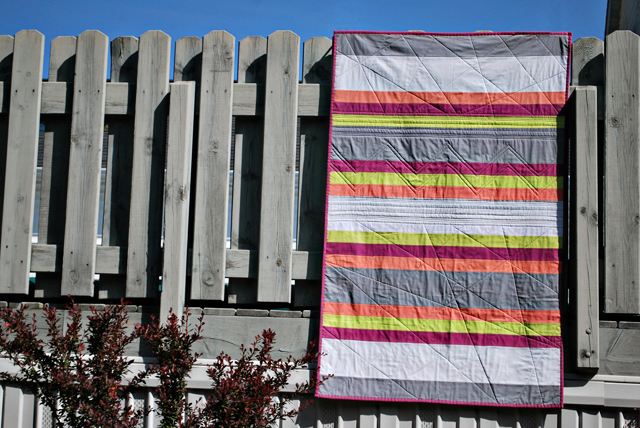 The back is just simple stripes, but the chevron quilting makes it a lot more fun! The solids I used are Kona Medium Gray, Cactus, Cerise, Melon, and White. It's bound in the Cerise as well. It is a larger baby quilt or small lap size, at 40" x 62". It folds up perfectly to show off the chevron! This one is listed in my shop! If you have a chance, make sure to stop by Amy's Creative Side to look through all of gorgeous quilts that have been linked up for the Blogger's Quilt Festival! VERY nice! I love the colourful simplicity of it. What a fresh and pretty quilt! 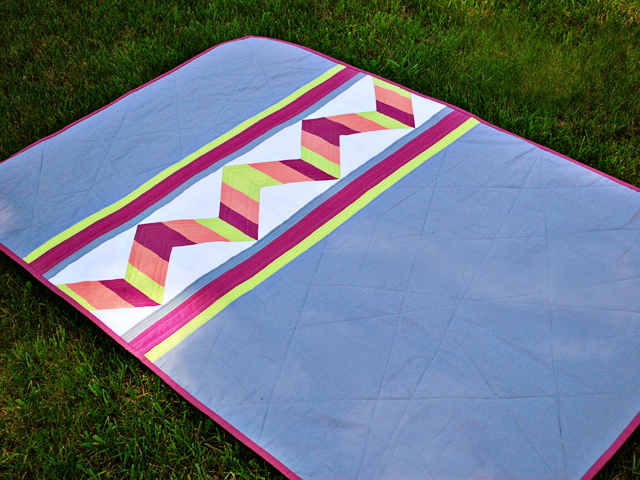 love the minimalist quilt, and the awesome chevron, but ESPECIALLY the amazing way you quilted it! Your chevron quilt is so much fun. I love everything about it. Love this one - glad to see it finally finished. The magenta binding is lovely. I love the quilted random straight lines. Looks fantastic. I love so many things about this quilt! 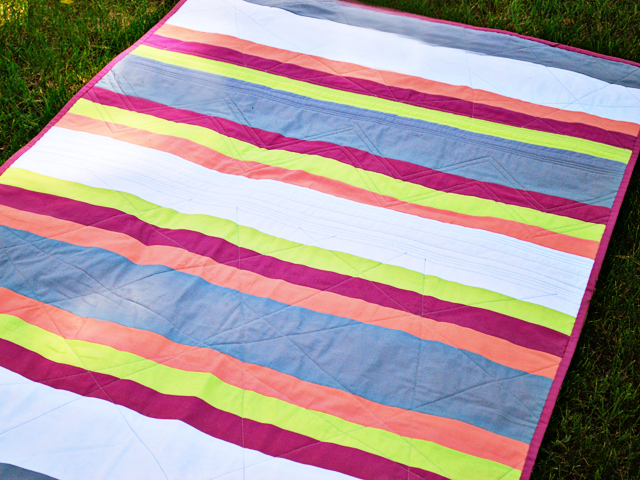 It's simple (color wise), but so bold, and the random line quilting is super awesome! Fabulous design, fabulous colours, fabulous quilt. This quilt is a beauty! It is simple but it sure has huge impact! Very cute-- I love the quilting on the zig zags! LOVE! the colors, the quilting...it's great!